EX-SERVICEMEN WELFARE: 7th Pay Commission - Increase in pay fitment factor from 2.57 to 2.81 and HRA from 24% to 30%- Clarification by Govt. 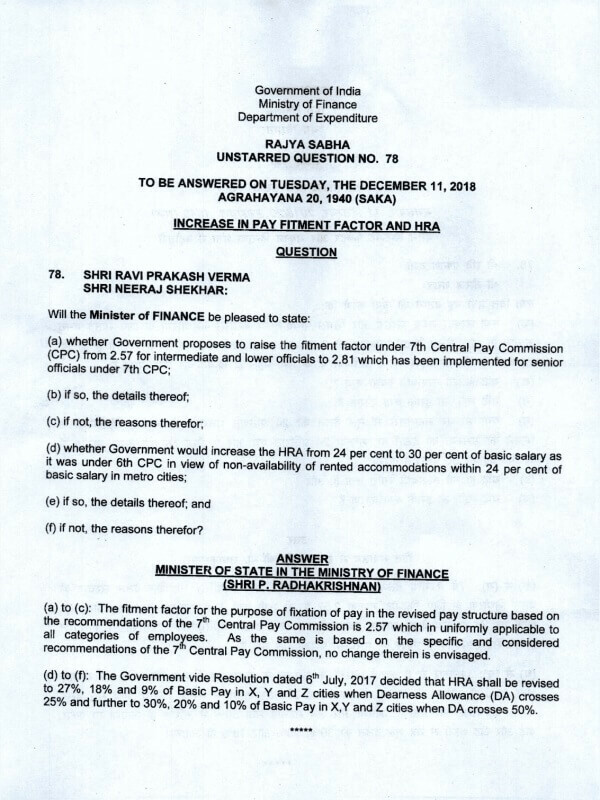 7th Pay Commission - Increase in pay fitment factor from 2.57 to 2.81 and HRA from 24% to 30%- Clarification by Govt. 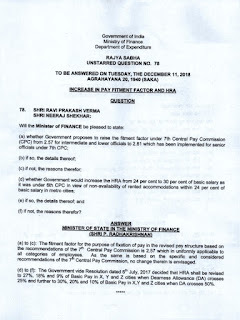 (a) to (c): The fitment factor for the purpose of fixation of pay in the revised pay structure based on the recommendations of the 7th Central Pay Commission is 2.57 which is uniformly applicable to all categories of employees. As the same is based on the specific and considered recommendations of the 7th Central Pay Commission, no change therein is envisaged. (d) to (f): The Government vide Resolution dated 6th July, 2017 decided that HRA shall be revised to 27%, 18% and 9% of Basic Pay in X, Y and Z cities when Dearness Allowance (DA) crosses 25% and further to 30%, 20% and 10% of Basic Pay in X,Y and Z cities when DA crosses 50%.